If you live in wine country around the US or are planning a Sideways inspired road trip along the coast, you may be wondering what iPhone apps could help you along your route. Below are the best iPhone apps that we’ve found, focused on giving you tips and information along the way. Whether you’re a cultured wine connoisseur of the world’s best fine wines or just getting started, you’ll need some help planning your wine tasting itinerary. Personally I’m not a wine snob and don’t pretend to know everything there is to know about wine, and these apps don’t do anything to help you with that either. Although getting out there in the real world does help to get you started. These iPhone apps are geared towards locating wineries, finding out their tasting room hours, fees, and address. Some provide photos, and a description of the wines produced at the winery. In the end it’s good to ask friends for suggestions and do some independent research as well when choosing wineries. Also if you do decide to hop on a pre-defined wine tasting tour, you’ll be able to look up the wineries in these apps to find out if they’re worth visiting. What I found out is that unfortunately there is not a single app that provides enough features and information that covers all wineries in all geographic regions. I’m also reviewing a few apps that focus on Napa valley and Santa Barbara Vineyards. So you may also want to look for a specific iPhone app that focuses on the specific wine region you are visiting. 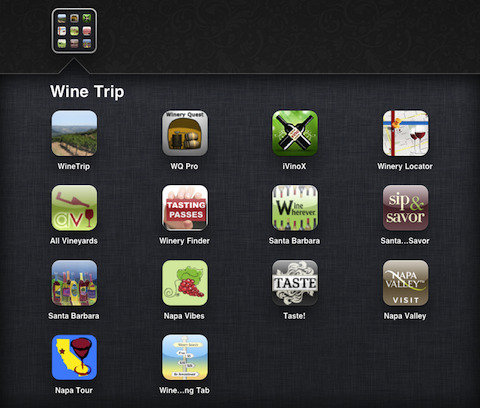 Wine Trip is probably the most extensive app for wineries in the US. The user interface is not flashy and can use work. You can find wineries by name, region, state, or zip code. Add wineries to a trip and view them on a map or as a list. Wine Trip also has a route function that gives you directions form your current location to the wineries along your trip route. Details provided are basics like address, hours, and contact info. Wine Trip includes wineries in California, Colorado, Oregon, and Washington. Although you get a ton of vineyards in CA, the app’s selection for the other three states is quite limited right now. Winery Quest Pro is a pricey iPhone app that gives you a directory of vineyards in California, split up by 20 regions. You can view the results as a list, on a map, or flip through a photo slideshow. You can filter the results further by picking from a wide range of winery features such as tasting fees, tours, dog friendly and more. If you are specific to a type of wine, you can also choose your wines to see which vineyards are showcasing them. Details per vineyard include a photo of the winery, phone, website, hours, wine prices, wines, ambience, activities and more. You can create trips and save wineries to them or just add places to your favorites list. Unfortunately overall UI is a bit clunky looking and navigating around the isn’t exactly intuitive. As an added bonus the Winery Quest Pro app has the capability to cache its list of wineries so you can use them offline. iVinoX has a clean user interface and feels like a well designed and thought out app overall. You can find wineries very easily using keyword search if you know the name already. There is an option to browse all entries by letter. For a more intuitive approach try the map search feature & pick regions on a California map to view a list of all respective vineyards. From the list of places select and add them to your itinerary list, which can be viewed on a map or as list. Places can be added to your favorites or shown on a map. No hours or tasting info are provided. The app gives you the latest news from the vineyard, which in most cases is not provided. Preferences lets you pick a series of wines, amenities and options you’d like to see when filtering out the results. While the map is limited to CA, you can find 60,000 wineries by name across the country. Finally you can maintain a cellar of your favorite wines. It is not too clear how to use this feature. Overall, iVinoX is probably the best app of this type I found although their database did not have a few of the wineries I was looking for, and lacks pricing and hours of operation information. iVinoX is a free app so be sure to test it out. By: The App Ranch, Inc.
Winery Locator is downloadable for free but you need to pay $3.99 to access its database of wineries. Although the database if quite large, the navigation is terrible in this app. To find a winery, you’ll have to pick either the name or the city by scrolling through an enormously large list. To make matters worse there are duplicate city names all over the place, meaning you’ll have to hop around to spot what you’re looking for, if you find it at all. Results are shown on a map, and you can tap to see basic details with addresses and phone numbers. Directions provided are limited to a route line, but don’t provide step by step instructions. Wineries can be saved to a favorites list, although you can’t see them as a list, only on a map. This app even has ads inside. Overall, Winery Locator is not worth paying for and lacks the navigation features that you would expect from a paid app. All Vineyard, (yes the “s” is missing from the app name) is a basic app for finding a very limited number of vineyards at 19 countries around the world. Details provided are pretty extensive including hours and tours, although no pricing is given. Overall this app is not worth its price tag and is not practical since it only provides a select few wineries from around the world. Napa Vibes is a free app that serves as a directory of wineries in the Napa Valley region in California. You can search for a winery by name, and see its address, phone number and hours. Wineries can be seen on a map although no directions are provided, and you can’t create or manage a trip. Napa Vibes also includes dining information for Napa visitors, as well as some photos and videos, plus Napa weather info is built in. Overall the app has sizable list of wineries, although its user interface and feature list are quite limited right now. Visit Napa Valley is another free iPhone app that provides not only a list of wineries but also gives you event information, tasting rooms, recreation and dining tips, hotels, shopping and nightlife details. Wineries contain a paragraph style information section that gives you an idea of what the establishment is about including tasting room hours. Results can be viewed on a map or as a list with easy to recognize icons. Wineries can be added to favorites, and directions can be provided from a virtual location. A few filters can be selected when searching for places for fine tuning your results. The UI isn’t perfect but it works. For a free app, Visit Nap Valley could be a potential good choice if you can live with the advertisements. Napa Valley Wine Tour is a wonderful universal app (iPad and iPhone friendly) for discovering all that Napa has to offer. The browse tab lists a large set of places in Napa Valley and you can filter the results from the drop down menu. The categories include Appointment only vineyards, wineries with tours, very small, views, picnic tables, caves, hidden gems and more. Sort the results by name, distance, cost and region. Each vineyard has a tasting room price, and most of them have a video review by Amicis Tours, which is an excellent introduction. You also have hours, website, address and phone numbers listed. The Photos tab lets you browse the same list in a gallery format which include maps and snapshots of the vineyards. The map view is not very useful since it uses photos as the pins, but if you tap on a pin you get more information. Finally a comments section is provided that lists the feedback other users of the app have left about various places. You can also add your own comments for any place in the app. Although you can mark places as “favorites” there is no trip planning feature in this app. Taste is a very simple yet user friendly iPhone app for planning a trip to the Napa valley wine region. The app uses a simple directory listing similar to the Contacts app, so finding a winery is very easy and quick. Search by name or swipe and or tap on letters to jump around the list. Filter the list by region (Napa or Sonoma), city, or distance, plus a wide range of other options like tasting fees, tours, pet friendliness, rating, and hours. Once you find a vineyard you like, tap to add it to your wine tour, and you may also favorite the place. You can rate the wineries and type in personal notes. When you view your created wine trips on a map, the Taste! app shows you pins for each place and you can tap each pin to quickly see if they are currently open. Taste is a great choice for those planning a trip to Napa, although for the price I would hope to have other wine regions added to the app. Wine Tasting Tab is another winery directory for Northern California (Napa, Sonoma, the Sierra Foothills, Lodi, Livermore, Santa Cruz) that works on the iPad and iPhone. Start by tapping the signs on a post to pick free, $5, $10, $25, by appointment only or do keyword searches on the entire area. One of the problems with this app is that you can’t just search for everything in one place. You have to go back and forth and try to various search options to extract what you want from the app which is frustrating. Once you do find a place you can add it to your favorites but you can maintain a trip list. Each winery has a ton of profile data including specials, hours, price, wine styles, amenities, varieties, associations, and output levels. Although the information provided in this the Wine Tasting Tab app is excellent, the bad user interface makes it a chore. Winery Finder is a free iPhone app that lets you find events, and deals on wine tastings in Northern California wineries. You can use this app to find free Tastings, 2 for 1 Tastings and other deals closest to you. The app also has a social aspect where you can check in to a winery, see who else is there, leave a comment “shout” about a place, and read other shouts. You do need an account for the social features. The app will send you a very annoying push notification from time to time to tell you about deals, so you will have to turn off its notifications in Settings if you don’t want to go crazy. Santa Barbara County Vintners’ Association have a free app for finding wineries in that area. The app uses a wheel menu where you can fine tasting rooms, wineries, tours, wine trails, events and more. Each listing comes with a full bio, photos, plus hours, pricing and contact information. You can also add any place directly to your iPhone’s contacts, get directions or add them to a favorites list. If you don’t like the wheel approach you can also search by keyword. The messages tab is where the app notifies you of wine events in the Santa Barbara county area. You can’t create or maintain a trip list with this app. Not all wineries are listed here, and the UI is not very graceful, and some of its features will not work if you are offline. But for a free app it is worth checking out, and probably the most useful one for the Santa Barbara County wine region at this point. Wine Wherever’s Santa Barbara edition iPhone app gives you a few nice features for discovering wineries in Santa Barbara. Search by keyword, or by region to find the winery you want. You can then write a journal about the place to save to a journals section, although you can favorite it or add it to a list of places you want to visit. The app also lacks any sort of information about the vineyards beside the address and phone number. Although the interface is very clean, the information provided is seriously lacking, and not all wineries are listed. Santa Barbara Sip & Savor is a free iPhone app created by Santa Barbara Conference & Visitors Bureau. The app is a bit clunky and has warning about “index.html update” when you run it which seems awkward. Finding a winery is only one of the options in the app, but it is extremely limited and poorly designed. You can basically see a list of the wineries per Santa Barbara county region (Lompoc, Buellton, Los Olivos, Santa Barbara, Santa Maria, Santa Ynez, Solvang, Summerland) or show them all. The list of wineries is incomplete and the detail pages lack any sort of useful information. You just get the address and phone number. There is no way to bookmark or save any place for later use. To make matters worse the navigation in the app is slow and rigid. AppSafari review of Winery Road Trip apps for your iPhone was written by Joe Seifi on September 9th, 2011 and categorized under App List, Food, Reference, Travel. Page viewed 8045 times, 3 so far today. Need help on using these apps? Please read the Help Page. Just wanted to thank you for giving iVinoX high marks in your review segment. One thing that is not clear, our fault, is that wineries have complete control of the information on their profile, as more wineries join (free also) our platform we’ll have more detailed information for consumers. We are also working on maps for all wine producing states & are preparing an international version. Once again thank you for your kind words. Thank you for Reviewing the “Winery Finder” App http://econcierges.com Thank also high marks. The App currently has the highest 5-STAR user reviews on iPhone in its category. It has quickly become the #1 downloaded App for Napa Valley, Sonoma and Wine Country. I suppose he fancies himself a master in this department. very amazing collection of road apps i never know that this kind of apps also available in the market.